Oak Alley Plantation, 3 hour city of New Orleans, cemetery, and Hurricane Katrina tour. You'll spend an unforgettable three hours on our comfortable air conditioned Mini-bus while getting an overview of New Orleans, and experiencing the history and culture of the Creoles with your licensed tour guide. No trip to New Orleans would be complete without seeing the highlights of our city and the some of the areas affected by Katrina’s flood waters. 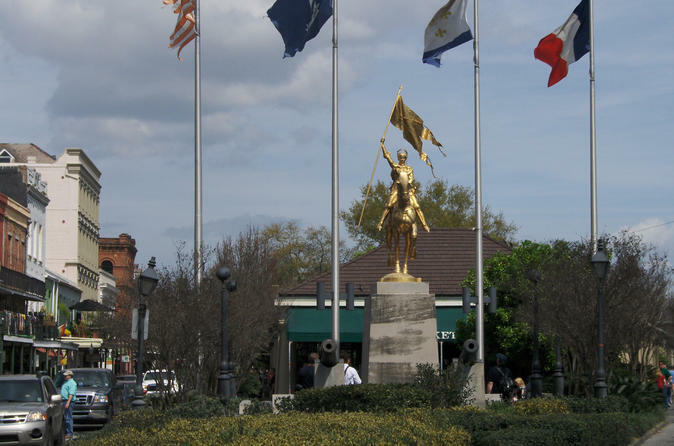 You will see Jackson Square, St. Louis Cathedral, the Cabildo and the French Market. Your tour guide will also give you an overview of the “French Quarter”, pointing out areas of interest, so that you can explore them later, at your own pace. On the way to the “Dueling Oaks” of New Orleans’ City Park, you will view 100 year old homes along Esplanade Avenue. You'll visit an above ground cemetery, where you will be given a short guided tour. Your tour guide will explain how the people of New Orleans bury their dead above ground in re-usable tombs. This tradition was by necessity, not by choice. You'll take a drive slowly down St. Charles Avenue, the American side of New Orleans, and see some of the homes of the Garden District. You will pass Ann Rice’s home, Governor Claiborne’s Daughters home, circa 1840, the Elms Mansion, and much more. You'll witness the diverse Architecture of the American side of New Orleans. In addition to the city tour, you'll take a drive out to the Oak Alley Plantation. This is one of the most magnificent plantation tours because of the 28, evenly spaced, huge Oak Trees that go from the river road to the Plantation House. Built in 1837 in the style of Greek Revival architecture, this house could to be straight out of the movie “Gone with the Wind”. Along with the antique farm equipment, the grounds also feature a restaurant, blacksmith shop and a souvenir shop. The choice is yours how you would like to use your free hour. It is a comprehensive plantation experience. The tour of the Oak Alley’s house is conducted by guides in authentic plantation style apparel. Walking is required for this tour. The distance from the plantation house to the restaurant and souvenir shop is about 1 block. There are benches along the path, shaded by the Oaks. The tour will be educational and enlightening, so that you can revisit and explore New Orleans’ attractions and points of interest. This is a must for anyone coming to the city. Your driver is a licensed “City Tour Guide” that will narrate along the way, during the course of the tour. This tour is an overview of New Orleans and the areas affected by Katrina. You will stop at a local cemetery for a short tour. We will have a 20 minute restroom/snack break in the middle of the tour. Tour times may run longer due to parades, traffic or road restrictions. The tour is conducted on a minibus and the guest(s) may stay aboard the vehicle for the duration of the tour. The only stops will be (1) the rest stop (2) the cemetery.